With an increasing demand for more lethality on vehicles, US vehicle manufacturer Textron has decided to develop its own larger calibre turret line. The company already makes its own turrets that can fit a 40mm grenade launcher or .50 cal machine gun. These are fitted to the MSFV 4x4 vehicles in Afghanistan and the Commando Select vehicles sold to Iraq and Colombia but now they are taking the next step to build 30mm gun turrets and larger. 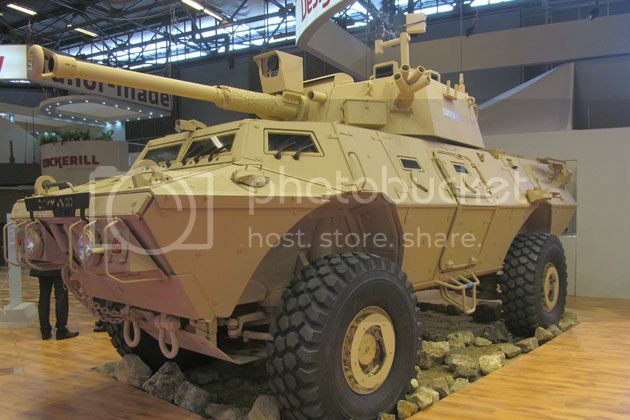 At IDEX, Jonathan Dalrymple, VP for business development at Textron's Marine and Land Systems division told Shephard that although their vehicle ranges can already integrate turrets, such as those from Belgian manufacturer CMI Defence, it can be difficult to export the vehicle in some circumstances because it is a non-US system. This creates problems if a customer wants to buy Textron's vehicles through the Foreign Military Sales (FMS) process or using US Foreign Military Funding (FMF) because the US military has to qualify and approve the product for export before it will help finance it. Dalrymple said that they expect to have a new 30mm turret ready by late-October 2017 and test-fire it in late-Q4. They can do this relatively quickly because the company already has experience building turrets and integrating them so it is not such a large step up to start increasing turret size and weight to support a larger gun calibre or an anti-tank missile system. He added that the company has the in-house capability to do this with modelling and simulation, vehicle designs, turret rings and bearings and works with a turret housing company that designs and manufactures the turrets. Costing just $1 million per vehicle, Textron's Commando vehicles have proven popular – Dalrymple said this has especially been the case considering the low oil prices of late now sitting at $50-55 a barrel. This which means many oil producing customers – like those in the Middle East – have less to spend on really expensive new vehicles. Therefore the company does not want to lose business due to restrictions in US legislation and wants to be able to offer its own turret product as a replacement if a customer is buying their vehicle through FMS and FMF and needs it delivered quickly. Dalrymple explained that Afghanistan was supposed to take delivery of 50 of their vehicles fitted with a Cockerill 90mm gun turret from CMI Defence. That vehicle combination needed to be approved by the US for export, but due to the change in the political environment and Afghanistan refusing to sign a bi-lateral defence cooperation agreement in 2014 it stopped the procurement because the US did not finish its testing and qualify the turret-vehicle combination. It was the same with the company's mortar variant. Afghanistan still has a requirement so Dalyrmple is heading back to the country to find out if they still want the 50. He said with Afghanistan in the lead there is a market for their turrets because of the FMS/FMF situation. Meanwhile, Textron is pushing its co-production strategy in the Middle East whereby the vehicle's monocoque hull and chassis is built by the company and sent to the customer so that they can integrate all the remaining equipment they want as well as carry out the acceptance testing and qualification thereby increasing the amount of the contract that is spent in the customer's own country. Dalrymple said that this is the export model they used for their Canadian TAPV contract and hope to emulate this in future contracts. For example the Canadian government decided on armour from Rheinmetall and a turret from Kongsberg. He added that both companies set up subsidiaries in Canada to work on the contract therefore it encourages sub-component suppliers to invest in the customer country. Para uns quantos, A serie V100/200 de VBTP(r) vulgo Chaimite é imprópria para uso mas para outros a serie Commando está perfeitamente apta para ser utilizada em combate. Lembra-me algo passado na década de 80 quando pura e simplesmente abatemos os CC M47 para recebermos os M48 enquanto que, ao mesmo tempo em Espanha..................enfim, somos uma rica Nação de Pobres, não temos dinheiro mas somos cá uns cagõezitos !! !